Valley Forge (CV-45)-built with money raised by the citizens of Philadelphiain a special war bond drive- was laid down on 7 September 1944 by the PhiladelphiaNavy Yard; launched on 18 November 1944, sponsored by Mrs. A. A. Vandegrift,wife of the Commandant of the Marine Corps, and commissioned on 3 November1946, Capt. John W. Harris in command. Following fitting out, the new carrier got underway on 24 January 1947for shakedown training which took her via Norfolk to Guantanamo Bay, Cuba,and the Canal Zone. She completed the cruise on 18 March and returned toPhiladelphia for post-shakedown overhaul. The ship left Philadelphia on14 July, headed south, and transited the Panama Canal on 5 August. She arrivedat her home port, San Diego, on the 14th and joined the Pacific Fleet. Followingthe embarkation of Air Group 11 and intensive air and gunnery training incoastal waters, the aircraft carrier-flying the flag of Rear Admiral HaroldL. Martin, Commander of Task Force 38-got underway for Hawaii on 9 October.The task force devoted almost three months to training operations out ofPearl Harbor before sailing for Australia on 16 January 1948. After a visitto Sydney, the American warships conducted exercises with units of the RoyalAustralian Navy and then steamed to Hong Kong. During a voyage from the British crown colony to Tsingtao, China, ordersarrived directing the task force to return home via the Atlantic. With herescorting destroyers, the ship continued the round-the-world trip with callsat Hong Kong, Manila, Singapore, Trincomalee, Ceylon; and Ras Tanura, SaudiArabia. After operating for a time in the Persian Gulf, she became the largestaircraft carrier to transit the Suez Canal. The ship finally arrived atSan Diego, via the Mediterranean Sea, the Atlantic Ocean, and the PanamaCanal. 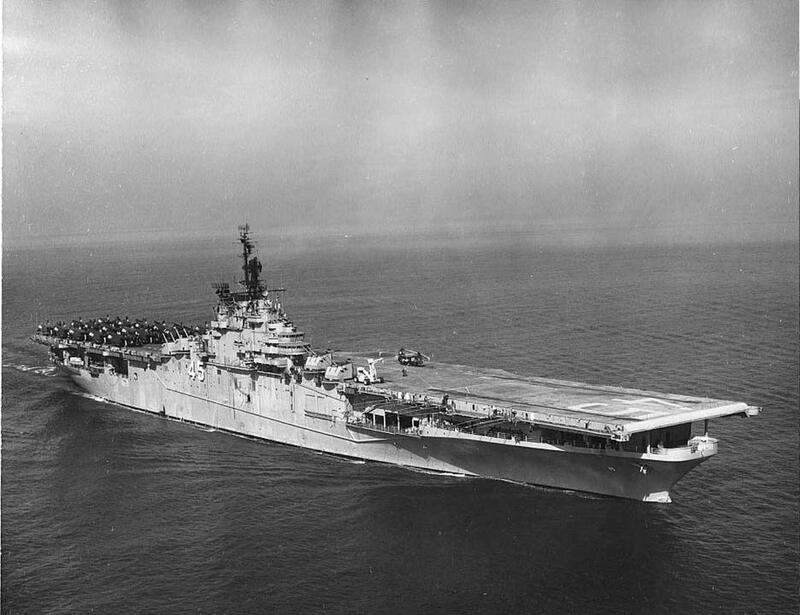 Valley Forge deployed to the Far East, departing the west coast on 1May 1950. While anchored in Hong Kong harbor on 26 June, the warship receivedelectrifying news that North Korean forces had begun streaming across the38th parallel into South Korea. Departing Hong Kong the next day, the carriersteamed north to Subic Bay, where she provisioned, fueled, and set her coursefor Korea. The first carrier air strike of the Korean conflict was launched fromValley Forge's flight deck on 3 July 1950. Outnumbered and outgunned, theSouth Korean troops battled desperately against veritable tides of communistinvaders. Waves of Douglas AD Skyraiders and Vought F4U Corsairs struckthe North Korean airfield at Pyongyang while Grumman F9F-2 Panthers flewtop cover. Tons of bombs from the attacking American planes pounded hangars,fuel storages, parked Russian-built aircraft, and railroad marshalling yards.Meanwhile, the escorting Panthers downed two Yak-9's and damaged another. In spite of attempts by United Nations forces to interdict the steadyflow of communist infantry and armor, the North Koreans steadily pushedthe defending South Koreans back into a tenuous defense perimeter aroundPusan. On 18 September 1950, the American landing at Inchon outflanked thecommunist forces while United Nations forces broke out of the perimeterto the south. During this period of bitter struggle Valley Forge's Air Group5 made numerous daily strikes against North Korean targets. Troop concentrations,defensive positions, and supply and communications lines were repeatedly"fair game" for the bombs of the Skyraiders and the rocket andcannon fire from the Panthers and Corsairs. Over 5,000 combat sorties delivered2,000 tons of bombs and rockets between 3 July and 19 November 1950.
with TF 77 three days before Christmas of 1950 Valley Forge recommencedair strikes on the 23d- the first of three months of concentrated air operationsagainst the advancing communist juggernaut. During her second deploymentthe ship launched some 2,580 sorties in which her planes delivered some1,500 tons of bombs. The communist blitzkrieg wavered to a halt by the end of January 1951,and United Nations forces once again pushed the invaders northward pastthe strategic 38th parallel. After nearly 10 months continuous duty in frequentlychilly and always inhospitable Korean coastal waters, Valley Forge sailedfor the United States on 29 March 1951. Following a major overhaul thatlasted into autumn, the ship emerged to become the first American carrierto return to Korea for a third deployment. On 11 December 1951, Valley Forge launched her first air strikes in railwayinterdiction. Rockets, cannon fire, and bombs from the ship's embarked airgroup, and those of her sister ships also on station, hammered at NorthKorean railway targets-lines, junctions marshaling yards, and rolling stock.Anything that could possibly permit the enemy to move his forces rapidlyby rail came under attack. By June, Valley Forge's train-busting Skyraiders,Corsairs, and Panthers had severed communist rail lines in at least 5,346places. Valley Forge returned to the United States in the summer of 1952 butwas again deployed to the Far East late in the year. In October 1952, shewas reclassified an attack carrier and redesignated CVA-45. On 2 January1953, she began the new year with strikes against communist supply dumpsand troop billeting areas behind the stalemated front lines. While the propeller-drivenSkyraiders and Corsairs delivered tons of bombs on their targets, the jetPanthers conducted flak-suppression missions using a combination of cannonfire and rockets to knock out troublesome enemy gun sites. This close teamworkbetween old- and newstyle planes made possible regular strikes against Korea'seastern coastlines and close-support missions to aid embattled Marine Corpsor Army forces on the often bitterly contested battle lines. Valley Forgeair groups dropped some 3,700 tons of bombs on the enemy before the shipleft the Korean coast and returned to San Diego on 25 June 1953. After a west-coast overhaul, Valley Forge was transferred to the AtlanticFleet and reclassified-this time to an antisubmarine warfare support carrier-andredesignated CVS-45. She was refitted for her new duties at the NorfolkNaval Shipyard and then rejoined the Fleet in January 1954. The face-liftedcarrier soon got underway to conduct exercises to develop and perfect thetechniques and capabilities needed to carry out her new duties. Conducting local operations and antisubmarine warfare exercises, ValleyForge operated off the east coast through late 1956, varied by a visit toEngland and the eastern Atlantic for exercises late in 1954. Her operationsduring this period also included midshipman and reservists' training cruisesand occasional visits to the Caribbean. eight destroyers, two submarines, and one squadron each of antisubmarinehelicopters, planes, and a landbased Lockheed P2V Neptune. A significantdevelopment in naval tactics, TG Alpha concentrated solely on developingand perfecting new devices and techniques for countering the potential menaceof enemy submarines in an age of nuclear propulsion and deep-diving submersibles. Valley Forge remained engaged in operations with TG Alpha through theearly fall of 1959, when she then entered the New York Naval Shipyard forrepairs. The ship returned to sea on 21 January 1960, bound for maneuversin the Caribbean. During her ensuing operations, the carrier served as thelaunching platform for Operation "Skyhook." This widely publicizedscientific experiment involved the launching of three of the largest balloonsever fabricated, carrying devices to measure and record primary cosmic rayemissions at an altitude of between 18 and 22 miles above the earth's surface. Following a deployment in the eastern Mediterranean -during which shecalled at ports in Spain, Italy, and France-Valley Forge returned to Norfolkto resume local operations on 30 August, continuing antisubmarine exercisesas flagship of TG Alpha through the fall of 1961. The carrier participatedin a Project "Mercury" operation, and her helicopters retrievedthe space capsule launched by a rocket from Cape Canaveral on 19 December.Two days later off Cape Hatteras, in response to an SOS, Valley Forge spedto tanker SS Pine Ridge, which had broken in two during a storm. While thesurvivors of the stricken ship clung tenaciously to the after half of thetanker, the carrier's helicopters shuttled back and forth to pick up themen in distress. Soon, all 28 survivors were safe on board Valley Forge. Entering the Norfolk Naval Shipyard on 6 March 1961 for overhaul andmodification to an amphibious assault ship, Valley Forge was reclassifiedas LPH-8 on 1 July 1961 and, soon thereafter, began refresher training inthe Caribbean. She returned to Hampton Roads in September and trained inthe Virginia capes area with newly embarked, troop-carrying helicopters.In October, the ship-as a part of the Atlantic Fleet's ready amphibiousforce-proceeded south to waters off Hispaniola and stood by from 21 to 25October and from 18 to 29 November to be ready to evacuate any Americannationals from the Dominican Republic should that measure become necessaryduring the struggle for power which afflicted that nation in the monthsfollowing the assassination of the longestablished dictator, GeneralissimoRafael Trujillo. After returning home late in the year, Valley Forge sailed from Norfolkon 6 January 1962, bound for San Diego and duty with the Pacific Fleet.At the end of three months of training off the west coast, the amphibiousassault ship steamed westward for duty in the Far East with the 7th Fleet.With the flag of the Commander, Ready Amphihious Task Group, 7th Fleet ather main, Valley Forge closed the coast of Indochina under orders to putashore her embarked marines. In Laos, communist Pathet Lao forces had renewedtheir assault on the Royal Laotian Government; and the latter requestedPresident Kennedy to land troops to avert a feared, full-scale communistinvasion of the country The amphibious assault ship airlifted her marinesinto the country on 17 May; and, when the crisis had abated a few weekslater, carried them out again in July. For the remainder of 1962, the ship operated in the Far East before returningto the west coast of the United States to spend the first half of 1963 inamphibious exercises off the coast of California and in the Hawaiian Islands. handling troops and troop helicopters. Putting to sea again on 27 January1964, the newly modernized assault ship rejoined the fleet and, followinglocal operations and training, departed Long Beach once more for anotherWestPac deployment. She stopped at Pearl Harbor and Okinawa, en route to Hong Kong, and thensteamed to Taiwan. In June, she joined ships of other SEATO navies in amphibiousexercises and then visited the Philippines where in July she was awardedthe Battle Efficiency "E."
On 2 August 1964, North Vietnamese torpedo boats attacked destroyer Maddox(DD-731) in the Gulf of Tonkin. Valley Forge then spent 57 days at sea offthe Vietnamese coast in readiness to land her marines should the occasiondemand. Returning-via Subic Bay, Okinawa, and Midway- to Long Beach on 5 November,Valley Forge made two round-trip voyages to Okinawa carrying marines andaircraft before commencing a WestPac deployment in the South China Sea inthe fall of 1965. With a Marine landing force embarked and flying the flagof Commander, Amphibious Squadron 3, Valley Forge conducted intensive trainingexercises in the Philippines while preparing for service in Vietnam. In mid-November, the amphibious assault ship stood by in reserve duringOperation "Blue Marlin" and then airlifted her marines ashorefor Operations "Dagger Thrust" and "Harvest Moon" beforespending the Christmas season "in the crisp freshness of an Okinawanwinter." After embarking a fresh Marine battalion landing force anda medium transport helicopter squadron, she sailed for Vietnam on 3 January1966. Following pauses at Subic Bay and Chu Lai, Valley Forge arrived offthe Vietnamese coast on the 27th and, two days later, launched her landingforces to take part in Operation "Double Eagle." Remaining on station off the coast, the ship provided logistic and medicalsupport with inbound helicopters supplying the men ashore and outbound "choppers"evacuating casualties for medical treatment back on the ship. Reembarkingher landing team on 17 February, Valley Forge proceeded northward, whileher marines took a breather. The second phase of "Double Eagle"commenced two days later, and the ship's marines again went ashore via helicopterto attack enemy concentrations. By February 26th, the operation had drawn to a close; and Valley Forgereembarked her marines and sailed for Subic Bay. Following a round tripto Danang the carrier steamed back to the west coast for an overhaul andlocal training along the California coast before again deploying to WestPac.Upon her return to Vietnamese waters, the ship took part in operations offDanang before she again returned to the United States at the end of theyear 1966. After undergoing a major overhaul and conducting training off the westcoast, Valley Forge returned to the Far East again in November 1967 andtook part in Operation "Fortress Ridge," launched on 21 December.Air-landing her troops at a point just south of the demilitarized zone (DMZ),the ship provided continual supply and medical evacuation (MedEvac) servicesfor this "search and destroy" operation aimed at eliminating NorthVietnamese and Viet Cong units which threatened American and South Vietnamesetroops. The completion of this operation on the day before Christmas 1967did not mark the end of Valley Forge's operations for this year, however,as she was again in action during Operation "Beaver Tooth," nearQuang Tri in northern South Vietnam. Upkeep at Danang preceded her deployment to her new station off DongHoi, where she provided her necessary resupply and MedEvac support for Alliedtroops operating against communist forces. Operation "Badger Catch,"commencing on 23 January 1968 and extending through 18 February, took offfor the Cua Viet River, south of the DMZ, before the ship set her coursefor Subic Bay and much-needed maintenance. Subsequently returning to the fray in Vietnam Valley Forge operated as"Hero Haven" for Marine helicopter units whose shore bases hadcome under attack by communist ground and artillery fire. During Operation"Badger Catch II," from 6 March to 14 April, Marine "choppers"landed on board the carrier while their land bases were being cleared ofViet Cong and North Vietnamese troops. Following a routine refit at SubicBay, the ship took part in Operation "Badger Catch III" from 28April to 3 June. She then moved to Danang and prepared for Operation "SwiftSaber" which took place from 7 to 14 June. Landing Exercise "HilltopXX" occupied the ship early in July. Then Valley Forge transferredher marines and helicopters to Tripoli (LPH-10) and headed home via HongKong, Okinawa, and Pearl Harbor. She reached Long Beach on 3 August. Following five months on the west coast which included local operationsand an overhaul, the amphibious assault ship returned to the Far East forthe last time departing Long Beach on 30 January 1969. At San Diego, she embarked a cargo of Marine CH53 Sea Stallion helicoptersfor delivery to transport squadrons in Vietnam. The ship stopped at PearlHarbor and paused near Guam while one of her helicopters carried a strickencrewman ashore for urgent surgery. She loaded special landing-force equipmentat Subic Bay and embarked the Commander, Special Landing Forces Bravo anda squadron of Marine CH-46 transport helicopters. On 10 March, the carrierbegan operating in support of Operation "Defiant Measure," steamingoff Danang as her helicopters flew missions "on the beach." Thiswas completed by the 18th, and Valley Forge debarked her helicopters beforesteaming to Subic Bay for upkeep. After her return to Danang on 3 May, the amphibious assault ship reembarkedher helicopters as well as part of a battalion landing team of marines whohad been taking part in fighting ashore. The carrier continued to operatein the Danang area during the weeks that followed, her helicopters flyingfrequent support missions, and her marines preparing for further combatlandings. During late May and early June, Valley Forge received visits from Secretaryof the Navy John Chafee and Vice Admiral William F. Bringle, Commander 7thFleet. She offloaded her marines at Danang on 10 June and embarked a battalionlanding team for transportation to Okinawa, where she arrived on the 16th.The landing team conducted amphibious exercises with Valley Forge for 11days and boarded the ship for a voyage to Subic Bay where they continuedthe training process. Valley Forge returned to the Danang area on 8 Julyand resumed flying helicopter support for Marine ground forces in the northernI Corps area. The ship took evasive action to avoid an approaching typhoonand then began preparations for an amphibious operation. Operation "Brave Armada" began on 24 July with a helicopter-borneassault on suspected Viet Cong and North Vietnamese positions in Quang NgaiProvince. Valley Forge remained in the Quang Ngai-Chu Lai area to supportthis attack until its completion on 7 August. She then steamed to Danangto debark her marines. General Leonard F. Chapman, the Commandant of theMarine Corns, visited Valley Forge that same day. The ship sailed for Okinawaon the 13th arriving four days later and debarking her helicopter squadronbefore getting underway again to evade another typhoon. She proceeded toHong Kong, dropping anchor there on 22 August, the day on which she receiveda message announcing her forthcoming inactivation. She returned to Danangon 3 September to load material for shipment to the IJnited States and sailedthat evening for Yokosuka for three days of upkeep before leaving the FarEast. Valley Forge got underway from Yokosuka on 11 September and anchoredat Long Beach on the 22d. After leave and upkeep, she offloaded ammunitionand equipment at Seal Beach and San Diego. The ship returned to Long Beachon 31 October to prepare for decommissioning. This process continued throughthe new year; and, on 16 January 1970, Valley Forge was placed out of commission.She was turned over to the Inactive Ship Maintenance Facility at San Diego.Her name was struck from the Navy list on the same day. After the failureof attempts to raise funds for using the ship as a museum, she was soldon 29 October 1971 to the Nicolai Joffre Corp., of Beverly Hills, Calif.,for scrap. Valley Forge was awarded eight battle stars for Korean War service andnine for Vietnam service, as well as three Navy Unit Commendations.